Conflict Archaeology adds a fresh perspective when examining the past. It contributes by examining the influences and effects of military activity within the landscape. There is a huge array of information available to researchers of military history. Evidence abounds from sources such as National archives to witness testimony. Field evidence is often overlooked. Our work aims to enhance our understanding of events by interpreting what survives on the ground. In effect, evidence in the landscape is regarded as another archival source. Concentrating in forests of France the team has been publishing papers since 2013. David Capps-Tunwell, David G Passmore and Stephan Harrison. Archaeological survey of well-preserved Second World War German supply depots and bomb craters from Allied air raids in the Forêt domaniale des Andaines, Normandy, has prompted an evaluation of the effectiveness of Allied intelligence gathering and tactical bombing of the German logistics network in advance of, and during the Normandy Campaign of June-August 1944. In conjunction with analysis of primary German and Allied archive sources, published historical accounts and aerial photographs we demonstrate that Allied intelligence knew of the importance of the forest as a major fuel depot and attacked it with at least 46 missions over the period 13 June – 14 August. However, landscape evidence demonstrates that only one of three fuel depot sites in the forest was successfully identified and partially destroyed by bombing. Allied intelligence efforts also failed to gather sufficient evidence to target one of the largest Seventh Army munitions depots in Normandy. Supply depots in the forest thus remained operational until late in the campaign and will have supported the German Mortain counter-offensive of 7-14 August. The limited success of Allied bombing in the Forêt domaniale des Andaines testifies to the difficulties in striking well-dispersed and camouflaged woodland facilities and supports the argument that the success of air power against German logistics efforts lay primarily in the degradation of the regional communications infrastructure and the Wehrmacht’s vehicle fleet rather than the destruction of supply dumps. David Capps Tunwell, David G Passmore and Stephan Harrison. Well-preserved bomb craters in the forests of central Normandy, NW France, constitute archaeological legacies of combat inland from the D-Day beachheads that greatly extend the inventory of Second World War conflict landscapes in northwest Europe. Field survey and analysis of German and Allied documents demonstrates that bombscapes in the Forêt domaniale des Andaines and Forêt domaniale d’Ecouves reflect US Ninth Army Air Force attacks on a German fuel depot and radar installation, respectively, during June-August, 1944. One hundred and thirty-six craters are mapped, described and linked to specific air raids, bomb types and, for one raid on the 13th June, six specific participating aircraft and aircrews. These landscapes echo the impact of widespread tactical bombing against targets close to civilian population centres, and in some cases employing civilian and PoW labour. They are therefore well-placed to contribute to wider heritage narratives around the non-combatant experience of aerial warfare in WW2. World War II Conflict and Post-conflict Landscapes in Northwest France: An Evaluation of the Aerial Photographic Resource’, in Stichelbaut, B. and Cowley, D. (ed.) Conflict Landscapes and Archaeology from Above, Farnham: Ashgate, Ch. 11: pp.185-204. This work explores the use of aerial photographs for investigating landscapes of World War II conflict associated with the Normandy Campaign and the bombing of German military sites in northwest France during 1943 and 1944, and also the lesser known history of landscape rehabilitation and remediation in the immediate post-war recovery period. The primary resource used was vertical aerial photographs at scales between c. 1:1,500 and 1:26,000, taken between 1945 and 1960 and accessible from the online archive hosted by the IGN. Our analysis focuses on rural areas impacted by one or more Allied air raids, either because they witnessed major Allied ground offensives or were the sites of German military installations. Areas of open agricultural land have rarely preserved any visible evidence of bomb damage, but here the photographic record enables analysis of the intensity and character of bombing and the immediate post-war remediation of farmland. Allied air raids also targeted supply depots and V-weapon facilities concealed in regional forests, and here it is demonstrated that forest clearance associated with fires and late- and post-war munitions disposal activities have combined to render formerly camouflaged military sites, bomb craters and remediation landscapes as readily visible on aerial images. Landscape archaeology of World War Two German logistics depots in the Forêt Domaniale des Andaines, Normandy, France. Archaeological survey in the Forêt Domaniale des Andaines has recorded nearly 900 discrete earthwork bunkers, building foundations, trenches, and other features associated with WWII German fuel, munitions and logistics depots. Documentary evidence establishes that these depots were administered from Bagnoles de l’Orne and were a key component of the Seventh Army logistics network before and during the Normandy Campaign of June-August 1944. Post-war survival of features has been remarkably good in this forested setting and it is argued that this likely constitutes one of the best-preserved and most extensive examples of a non-hardened WWII archaeological landscape yet documented in Western Europe. David G Passmore, Stephan Harrison and David Capps Tunwell. Concrete fortifications have long served as battle-scarred memorials of the Second World War. 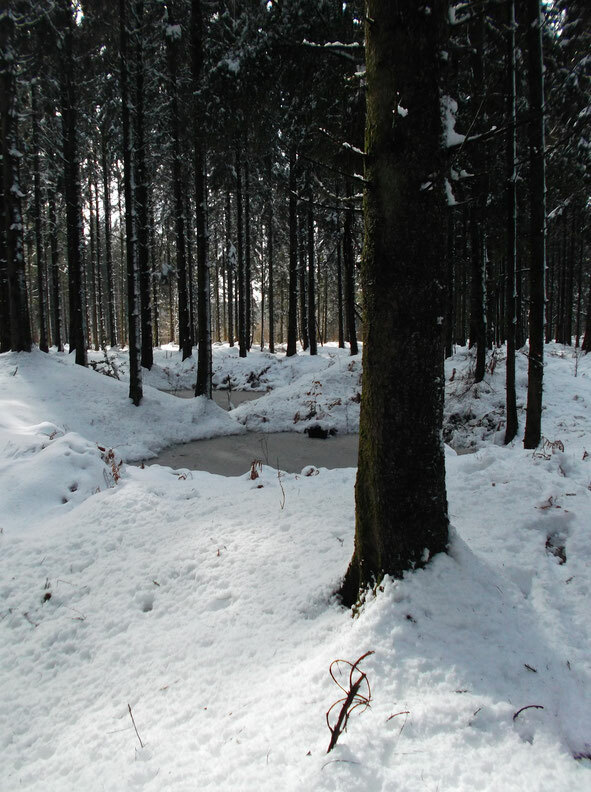 The forests of north-west Europe, meanwhile, have concealed a preserved landscape of earthwork field fortifications, military support structures and bomb- and shell-craters that promise to enhance our understanding of the conflict landscapes of the 1944 Normandy Campaign and the subsequent battles in the Ardennes and Hürtgenwald forests. Recent survey has revealed that the archaeology surviving in wooded landscapes can significantly enhance our understanding of ground combat in areas covered by forest. In particular, this evidence sheds new light on the logistical support of field armies and the impact of Allied bombing on German installations. David G Passmore, David Capps Tunwell and Stephan Harrison. Earthworks associated with WWII German military supply depots are shown to be well preserved on the modern forest floors of the Forêt domaniale des Andaines in central Normandy, North-west France, and are located within the record of the Seventh Army logistics network developed prior to the D-Day landings in June 1944. Features are typically located alongside forest roads and tracks and collectively amount to a military archaeological landscape that extends for nearly 10 km. Pilot survey of 50 discrete features demonstrates that at least three different storage facilities are evident, with variations in the size and morphology of bunkers that are consistent with the requirements of different types of munitions, fuel, foodstuffs, and vehicles. Numerous bomb craters also record Allied attempts to destroy the facilities. It is concluded that by the standards of WWII archaeology in the North-west European theatre, the Forêt domaniale des Andaines has permitted an exceptional state of preservation for non-hardened military facilities and combat-related damage.